^ 1.0 1.1 Feldstein, Y. I. Some problems concerning the morphology of auroras and magnetic disturbances at high latitudes. Geomagnetism and Aeronomy. 1963, 3: 183–192. Bibcode:1963Ge&Ae...3..183F. ^ 2.0 2.1 Feldstein, Y. I. A Quarter Century with the Auroral Oval. EOS. 1986, 67 (40): 761. Bibcode:1986EOSTr..67..761F. doi:10.1029/EO067i040p00761-02. ^ Paul Fleury Mottelay Bibliographical History of Electricity and Magnetism. Read Books, 2007, ISBN 978-1-4067-5476-6. p 114. ^ Scientist and Inventor: Benjamin Franklin: In His Own Words... (AmericanTreasures of the Library of Congress). Loc.gov. 16 August 2010 [26 July 2011]. （原始内容存档于2011年6月28日）. ^ Fritz, Hermann (1881). "Das Polarlicht." ^ S. Tromholt, Om nordlysets perioder/Sur les périodes de l'aurore boréale, l'annuaire 1880, Inst. Météorol. Danois, Copenhagen, 1882. ^ Crooker, N. U.; Feynman, J.; Gosling, J. T. On the high correlation between long-term averages of solar wind speed and geomagnetic activity. NASA. 1 May 1977. ^ Hirshberg, Charles. My Mother, the Scientist. Popular Science. Bonnier Corporation. 18 April 2002. 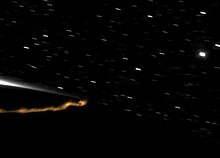 ^ NASA – THEMIS Satellites Discover What Triggers Eruptions of the Northern Lights. Nasa.gov. [26 July 2011]. （原始内容存档于2011年6月29日）. ^ Angelopoulos, V.; McFadden, J. P.; Larson, D.; Carlson, C. W.; Mende, S. B.; Frey, H.; Phan, T.; Sibeck, D. G.; Glassmeier, K.-H.; Auster, U.; Donovan, E.; Mann, I. R.; Rae, I. J.; Russell, C. T.; Runov, A.; Zhou, X.-Z. ; Kepko, L. Tail Reconnection Triggering Substorm Onset. Science. 2008, 321 (5891): 931–5. Bibcode:2008Sci...321..931A. PMID 18653845. doi:10.1126/science.1160495. 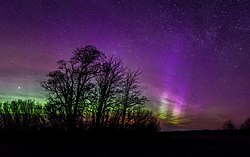 ^ Secret of Colorful Auroras Revealed. Space.com. 24 July 2008 [26 July 2011]. （原始内容存档于2011年6月28日）. ^ "gerry". 极光与流星. 科学松鼠会. 2009年9月17日 （中文）. 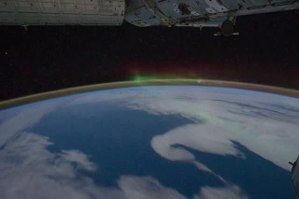 ^ NASA – NASA and World Book. Nasa.gov. 7 February 2011 [26 July 2011]. （原始内容存档于2011年6月29日）. ^ N. Østgaard, S. B. Mende, H. U. Frey, J. B. Sigwarth, A. Asnes, J. M. Weygand. Auroral conjugacy studies based on global imaging. J. Of Atmos. And Solar-Terres. Phys. 2007, 69 (3): 249–55. Bibcode:2007JASTP..69..249O. doi:10.1016/j.jastp.2006.05.026. 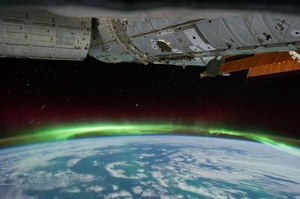 ^ Windows to the Universe - Auroral colors and spectra. ^ Frey, H. U. 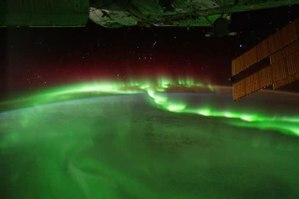 Localized aurora beyond the auroral oval. Rev. Geophys. 2007, 45: RG1003. doi:10.1029/2005RG000174. ^ University of Minnesota Style Manual. .umn.edu. 18 July 2007 [5 August 2010]. （原始内容存档于2010年7月22日）.